Wild hogs cause more than $66 million in property damage in Mississippi every year. They are threatening our economy, farms, lifestyle, treasured places, and native wildlife. Wild hogs are pests, not trophies. They carry disease, destroy farmland and trees, and eat the eggs and young of wildlife like quail, white-tailed deer, wild turkey, and even songbirds. Wild hogs are non-native nuisance animals. In 1988, they were present in only 23 counties. Today, they are found in all 82. If we all do our part, we can hold our ground against wild hogs. If you see wild hogs on your property, trap and kill them. It is illegal to transport and release live wild hogs in Mississippi. If you see anyone transporting or releasing live wild hogs, report it immediately. Call the number below. 24-hour hotline managed by Mississippi Department of Wildlife, Fisheries, & Parks. Identify where the hog damage is. Put up game/trail cameras in the damaged area. Examine the photos to see where hogs are coming from and how many there are. Choose the right trap size and design. Build a trap with the gate facing the hogs' trail. Bait the trap with corn or other feed. Let the wild hogs feed inside the trap for a few days—until they feel comfortable consistently entering the trap. 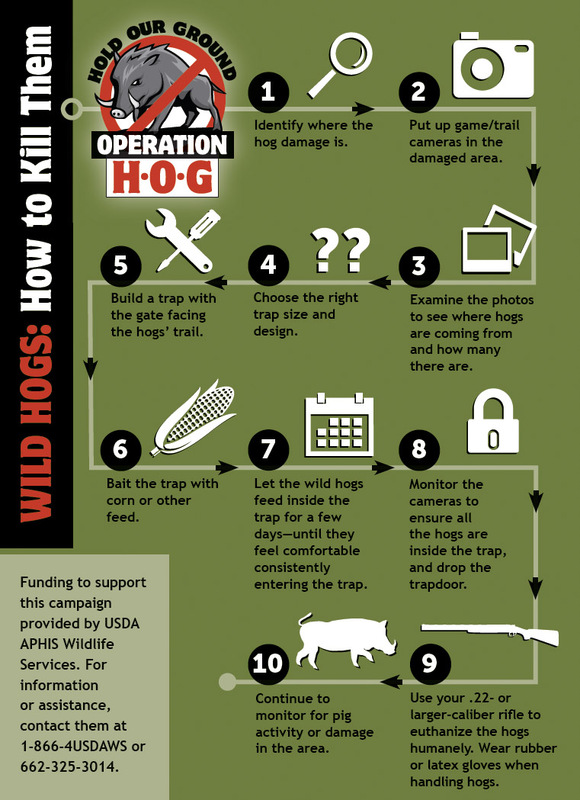 Monitor the cameras to ensure all the hogs are inside the trap, and drop the trapdoor. Use your .22 - or larger-calliber rifle to euthanize the hogs humanely. Wear rubber or latex gloves when handling hogs. Continue to monitor for pig activity or damage in the area. Funding to support this campaign provided by USDA APHIS Wildlife Services. For information or assistance, contact them at 1-866-4USDAWS or 662-325-3014. STARKVILLE, Miss. -- Wild hogs are a tremendous problem for farmers and landowners throughout the state of Mississippi. Hunting season preparation is done to increase our odds of harvesting some of the special and iconic native species that we are fortunate to have in Mississippi, whether we're targeting white-tailed deer, small game, waterfowl or a combination of quarry. Whatever we hunt throughout the rifle season, we all want to increase the success of our outdoor, sport-hunting experience -- while at the same time, decreasing the available space in our freezers. Wild hogs are known to cause external damage to land, property and wildlife, but the internal diseases they carry are equally dangerous. More than 40 known diseases are traced to wild hogs, but the two most common in Mississippi are pseudorabies and swine brucellosis. Each can be deadly to livestock and domestic animals. The best way to prevent these infections is to trap and kill hogs rather than simply building fences to keep them out. Trevor Garrett stays busy. He divides his days between farming soybeans with his father, Johnnie Ferrell Garrett, and working as a research associate at Mississippi State University's Pontotoc Ridge–Flatwoods Branch Experiment Station.